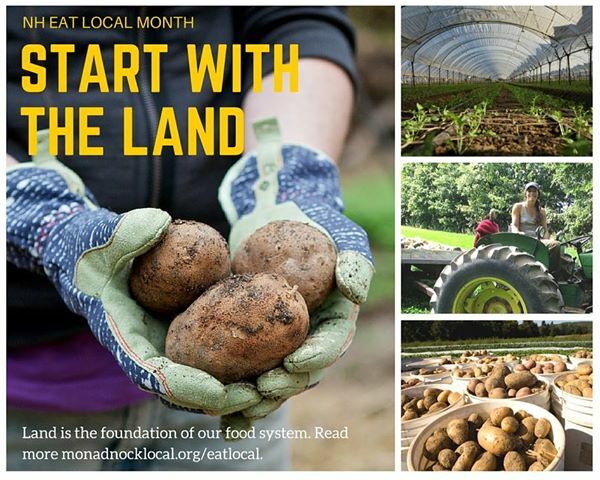 Throughout the month of August, TLC Monadnock joins with 70+ partners throughout the state to highlight New Hampshire Eat Local Month -- a month-long celebration of local food and New Hampshire farmers and producers. All month long, we hope to inspire you to eat more locally grown, raised and made foods, meet the farmers, growers and chefs behind your food and learn new skills that keep you eating locally throughout the year. As part of the NH Eat Local Month festivities, we will feature Monadnock Region local food and farm events on its website and social media posts. NH Eat Local Month also coincides with National Farmers' Market Week, honoring farmers' markets all across America. New Hampshire Eat Local Month is a statewide celebration of farmers and local food producers throughout the month of August. Thank you to all the NH Eat Local Month partners! Land is the foundation of our food system and Land For Good, based right here in Keene, specializes in connecting farmers with farmland. Seventy percent of our nation’s farmland is expected to change hands in the next two decades. Without a focused effort, much of that land will go out of farming, and with it, the hopes of a new generation of passionate and savvy farmers. Land For Good leads such an effort, involving everyone — farmers, families, landowners, community leaders, agencies, service providers, advocacy groups and local citizens — to ensure that farmland stays farmland. “If where your food comes from matters to you and your community, then you need to be concerned about keeping the farmers who produce that food on the land in a way that they can plan for the future of their business — and their farm’s legacy,” shares Jim Hafner, Executive Director of Land For Good. Many of Healthy Monadnock’s programs support a robust local food system, contributing to the ultimate goal of becoming the healthiest community in the nation. One of these programs, Monadnock Menus, managed by Cheshire County Conservation District, aggregates and delivers locally produced food to businesses and local institutions — creating a simpler way to buy local food. New restaurant buyers include the Hancock Inn, Luca’s Mediterranean Café and Charcoal Charlie’s. The Fall Mountain School District, RiverMead Lifestyle Community, and Cheshire Medical Center purchase local produce for their dining halls, and caterers, such as Free Range Chick, are using Monadnock Menus to source local foods for events. Monadnock Menus recently named the Monadnock Food Co-op a “Local Food Champion.” The Co-op, a community-owned full-service grocery store and café in downtown Keene, purchases products from nine local food producers through Monadnock Menus, representing over one third of all program sales. Echo Farm Puddings, from Hinsdale, is among the hottest brands available at the Co-op. By purchasing these and other local products, Co-op shoppers are supporting Monadnock Menus’ efforts to scale up and deliver fresh, local, affordable food to all the schools in the Monadnock Region. With the Co-op as an anchor, Monadnock Menus is able to reach twenty-four other buyers and offer products from twenty-eight local food producers. In addition to its support for Monadnock Menus, the Co-op strengthens our local food system by bringing products from 186 farmers and food producers based within 110 miles of the Co-op all under one roof — open 7 days a week. The Co-op also offers events, such as farm tours and tastings that help shoppers get to know the farmers behind each product. To find a local choice at the Co-op, look for the orange tags the next time you shop. The Monadnock Farm and Community Coalition (MFCC) gathers its 48 member organizations quarterly to support programs, identify and build new collaborations and share resources in support of its mission to build a sustainable food system in the region. MFCC will host two community forums this fall. At the Conversations Around Local, State and Federal Policy forum on September 30th at Stonewall Farm, MFCC will give updates on policy work supportive of agriculture. During the Feast on This! Film Festival on November 9-15 venues throughout the region will feature movies that highlight a diversity of issues and viewpoints related to food and agriculture. These films will spark conversations around what we value about the farms in our region, and actions we can take to support them. While New Hampshire Eat Local Month comes to close, learn more about all the initiatives strengthening our local food system at yardenofeatin.wordpress.com and mfccoalition.org. And put next year’s celebration in your calendar now and bookmark nheatlocalmonth.org on your web browser. There are now three opportunities each week to shop at the Farmers’ Market of Keene. A new Thursday Market time was recently added, from 5 – 7 p.m. at the Colony Mill Marketplace parking lot along Island Street. The Tuesday & Saturday Market days are still at their usual time and place, 9 a.m. – 1 p.m. at Gilbo Avenue. In addition to August being NH Eat Local Month, the first week of August is also National Farmers Market Week. To celebrate both events, why not visit a farmers’ market each day of the week from August 3 – 9? Check out Monadnock Table Magazine’s farmers’ markets list to help you meet this challenge. The Cornucopia Project plans to grow more local food for the community — with the community — by creating a community garden at the Peterborough Community Center. The garden will feature a spiraling path inviting visitors to stroll past the edible berry plants, herb garden, flowerbeds, greenhouse and mini-amphitheater. All the produce raised by Cornucopia staff and volunteers will go right to the Peterborough Food Pantry and Senior Lunch Program, also housed at the Peterborough Community Center — making the distance between garden to plate incredibly short. Once complete, the Peterborough Recreation Department will offer gardening classes. A fundraising campaign is also underway to renovate the center’s existing kitchen into a full commercial kitchen — which means cooking classes are also in order. Learn more about the Cornucopia Project. Last year, the New Hampshire Farm to School Program launched NH Gleans to support six gleaning coordinators throughout our state. Gleaning means harvesting the surplus produce from farms and gardens and directing it to local pantries, shelters and soup kitchens. We’re incredibly fortunate to have two gleaning programs in the Monadnock Region, one hosted by the Community Kitchen of Keene and another with the Hillsborough County Conservation District. Last year, the Community Kitchen gleaned over 16,000 pounds of produce last year. Learn more about gleaning on August 20, 5:30 pm – 6:30 pm at the Monadnock Food Co-op. Sarah Harpster from the Community Kitchen of Keene’s Gleaning Program will share information about gleaning and how it fights hunger, supports local farmers and reduces waste. She’ll also share how you can get more involved in this effort. Discover more about NH Gleans. Now over a year old, the Monadnock Food Co-op offers the region’s largest selection of local and sustainably grown products together under one roof — making it easier for you to make a choice that supports our local food system. Currently, the Co-op carries products from 177 farmers and local food producers who grow and make their products within 100 miles of the Co-op. This August, the Co-op will serve up a full plate of events, focusing on local food and farms, to celebrate NH Eat Local Month. Learn more about the Monadnock Food Co-op. The Monadnock Region Permaculture Group, sponsored by The Sustainability Project, offers events and an online forum for permaculture enthusiasts to connect and learn together. Permaculture uses ecological principles to design and regenerate healthy, productive landscapes and communities. The group’s offerings include films and educational speakers, permaculture farm & garden tours, discussion and book study groups, hands on experiences, community garden building, energy conscious living, seed and plant swaps and social events. Learn more at this Meet Up Group. The Cheshire County Conservation District compiled a list of farms in Cheshire County and identified which farms are open to visitors. See their map and guide to local farms. First let’s take a quick step back and define what a local food system. Think of it as all the pieces needed to bring local food from the farm to your plate: the soil, farm labor, transportation to distribute these goods to markets, and the list continues. These pieces come together to form our local food system. How does a healthy local food system bolster our local economy? While there aren’t yet comprehensive studies for the Monadnock Region, there are impressive findings from other states that quantify farms’ effects on local economies. In 2011, the Capital City Public Market in Boise, Idaho spurred $4.5 million in economic activity in their local economy. Sales of local food by farmers in northeast Iowa increased from less than $10,000 in 2006 to over $2 million in 2010, creating 26 new jobs. Mississippi farmers’ markets have a total economic impact of $1.6 million, including 15.88 part-time jobs, $213,720 in wages and $16,000 in state and local taxes. Farms that sell their produce locally also create more jobs. A 2011 Economic Research Service report found that farms selling at local and regional markets have 13 full-time workers for every $1 million in revenue. Farms not selling locally, however, employed only 3 full-time workers per $1 million in revenue. When farmers come together to form farmers’ markets they multiply their effect on the local economy by attracting more sales to neighboring businesses. In 2010, a study of the Easton Farmers Market in Pennsylvania found that 70% of farmers’ market customers also shopped at downtown businesses, attracting an extra $26,000 of sales each week. Discover more about farmers’ markets as economic engines. Now let’s turn to the Monadnock Region. There are numerous businesses, organizations and initiatives working to strengthen our local food system. Starting with the land, The Monadnock Conservancy & Land for Good are working to make more farmland available to farmers through farm transfers, agricultural easements and other programs. Helping to move food from the farm to your plate is Harvest to Market, an online local food ordering system where individuals can pre-order products and pick them up a participating market. The Cheshire County Conservation District’s Market pilot project connects schools and other institutions in the Monadnock region with local farms and fresh produce. There’s a medley of groups educating both young and old on how to grow local food: The Cornucopia Project, Orchard School, Transition Keene, Early Sprouts Program, Federick Hooper Institute, The Sustainability Project, Stonewall Farm and Keene Community Garden Connection – plus many individual schools. The quarterly Monadnock Table Magazine does a beautiful job of highlighting the farms and farmers who grow our local food, while the Monadnock Localvores offer a variety of workshops from April to October, and their monthly newsletter helps you find (and inspires you to eat) more local food. The Yarden of Eatin Blog features news and events about local food, farming and permaculture. Educating farmers is also an important component of our local food system, and the Cheshire County Conservation District, Hannah Grimes Center, UNH Cooperative Extension, and Small & Beginner Farmers of Cheshire County provide such training, plus other resources, to farmers. There are many places to purchase local food in our region, both fresh and processed, from Farmers’ Markets & Farm Stands, such as the Farmers’ Market of Keene, Alyson’s Orchard and Tracie’s Community Farm, to grocery stores such as the Hannah Grimes Marketplace, Nature’s Green Grocers and the Monadnock Food Co-op. To gather and support all these pieces into a more sustainable system, the Monadnock Farm & Community Coalition is a regional coalition whose mission is to support a sustainable food system by cultivating community action and building collaborations to implement effective programs, projects and policies. There’s a wonderful website that summaries Cheshire County’s Food System at http://cheshirecountyfoodsystem.weebly.com; but there are many more working to bring more local food to our plates. Know of one not mentioned above? Contact us at monadnockbuylocal@gmail.com. Together let’s work to build a stronger local food system – and a stronger local living economy in the process.